In the dark and ancient days of digital yellow highlighters and outrageous claims, a cry rang out over the mountains — a cry for sanity, integrity, and beauty. There came forth from the mountain 10 commandments to guide a certain tribe of Internet publishers in all their conversion endeavors. The landing page would no longer be a desert of confusion and bad taste. Its goal would now shift to the ethical and neighborly persuasion of the prospect to take their desired action. These are 10 Commandments of Landing Pages That Work. Thy landing page shalt have but one goal, and the number of the goals shall be one. Not two, not zero, but one. If thy landing page hath zero goals, it is a “branding” page, and such vanities shall bear no fruit. If thy landing page hath more than one goal, thou shalt confuse thy visitor, who shall leave thy site in disgust and anger. Thy copy shalt not be divided amongst more than one goal, for such shall surely drive thy visitor to lamentation and thy copywriter to madness. Thou shalt not litter thy landing pages with false images nor unecessary imagery, but only that which is gainful and relevant. Let not a cute kitten, playful puppy, happy child, nor LOLcats appear except as and when they shalt be — in context — perceived as deeply relevant and meaningful. Neither shalt thy litter thy prose with false imagery nor “creative” allusions that might leadeth thy visitor from the path of righteous goal completion. Neither shalt thee fail to disclose thine affiliations, lest the FTC rain down upon thee like a plague of locusts. Thou shalt not take the name of an authority in vain, for such false endorsements shall land thee in the court of man forthwith. Further, thou shalt honor thine own name by keeping thy promises, in headline, subhead, graphic, offer, delivery, and guarantee, that thy days on the Internet shall be boundless and fruitful, and thy reputation pure. Remember thy whitespace, to keep thy landing page scannable and readable. For thy visitor doth not read in earnest, nay, preferring to skim and skip and scan. So break up thy text, and include ye in all things subheaders and bullet points and simple sentences anon, so thy visitor may find succor in thy text. Honor thy web host, thy bandwidth, and thy client, that thy load times shalt not be excessive and the patience of thy visitor shalt not be exhausted. For thy visitor is Busy and Impatient, and hath not time to waste waiting for thy site to load. But yea, if thy page doth load quickly, thy visitor may tarry and thy bounce rate shalt surely dwindle. Thou shalt not kill thy visitor’s interest with boring copy. Thy copy shall flow like a river unto the sea, carrying thy visitor along in the gentle current of thy persuasions to the port of goal completion. Thou shalt not kill thy visitor’s trust with unbelievable claims. Thy claims shalt have proof, and trust marks, and yea, testimonials and demonstrations sufficient to support and prove thy remonstrations beyond faith and suspicion. By this ye shall overcome all objections and prosper. Thou shalt not kill thine integrity with suspicious associates, nor thy reputation through excessive returns and unresolved support issues. Thou shalt not adulterate thy premise nor offer by dabbling in external irrelevancies, but shall remain faithful to the visitor and goal throughout thy prose and yea, unto the end of thy landing page shall it serve thee. Maketh thee no mark upon thy page that doth not contribute towards thy goal. Thou shalt not steal thy visitor’s attention, time, coin, and bandwidth, but shall inform, educate, and persuade only after receiving consent and permission. Thy shalt deliver value in all things, and thou shalt not engage in any activity of scam nor spam, nor even the appearance thereof. Collect ye no information unnecessarily, for each such imposition burdens thy visitor with doubt and fear. Thou shalt always speak the truth about thy product, thine offer, thy guarantee, and thy competitors. Thou shalt not bear false witness in any event, for surely thine integrity is worth more than gold. And if it be not so, remove thyself from the Internet. Thou shalt not covet thy visitor’s cash, nor his credit card, nor his email address, nor his phone number, nor anything that is thy visitor’s. Thou shalt provide value in fair exchange, and in all things eschew deceitful schemes and trickery. Thou shalt love thy customer as thyself, and for all thy days shall ye serve him in gladness. Go ye forth now and take heed of these Commandments. Honor them on all pages. Disregard them at thy peril. Hast thou a commandment to share with thy fellow marketers? Speaketh thy voice within the comment box below. About the Author: Steven A. Lowe knows 101 Ways to Land More Business Using Landing Pages. When he’s not studying marketing and copywriting or reading copyblogger.com, he runs Innovator LLC, which specializes in innovative consulting and custom software development. Steven A. Lowe is a consultant, software developer, inventor, entrepreneur, author, musician, and lover of puns. He ran an innovative custom software development company for nearly a decade before joining ThoughtWorks as a Principal Consultant in 2014. Check out Steven's ebook series on landing pages, and follow him on Twitter. #5 is a problem for me. My site doesn’t load quickly, and I don’t know why. Try adding a cache plugin like W3 or upgrading your server. You might need a VPS if you are on shared hosting. Try checking any images you can control for extreme sizes. If necessary try converting them to lower quality/file-size image formats in Gimp or Photoshop. This may drastically help your loading time. – old theme -> use Genesis! Drop me a line if you would like some advice on fixing these. great list of things to check! Excessive plugins or bad plugins is always a good place to start but every point is well taken. I’m facing this issue of having too many plugins (which I need) and busy CSS. What do you recommend? Thus shall ye know the truth, and the truth shall set ye free. Hey I think you need to do some ui optimization and need to check for database queries. if any. Well said, Steven, and cleverly put. Even as an atheist I can appreciate the timeless biblical reference. The Internet is our first contact with the rest of the virtual world – and first impressions are still lasting impressions. So unless you wear advertising on your body (and many of us do) and go around talking in long, boring paragraphs (and some of us do that, too), don’t let your digital self get sloppy. Thanks be unto thee, Lorrie, for thy praise and understanding. As thee counseled, dress thy site in robes of wisdom, and ye shall surely prosper. That was one of the most creative pieces I’ve seen in quite some time, not to mention inspiring! Can I get an amen??! You got it! Love the Monty Python references :). As thee hast beheld the wisdom, ye shall go, and sin no more! Great post! I think #1 is the hardest commandment for a lot of companies. They have so much they want to say/do that their messaging gets lost in the mix and their customers get lost along with it. Thank thee, Nick, thy observation bears witness to thy prescience. A raging river destroys; a gentle drip wears away the stone of resistance. Best (and funniest) post of 2012 thus far! I am sending this to everyone in my office. Well done, Steven. Incisive, informative, and funny! My compliments to you. A stunner of an email – I read to the end. It’s funny and TRUE. Love the Monty Python spoof! Glad I’m not the only one who caught this!! …if I do not follow thy will. Thou save us. I know, I know, I really need to revisit this. I need to make a social-media specific landing page, but mine is a personal DIY lifestyle blog with a long term goal of consulting work, and I am having a hard time focusing my messaging. As soon as I get a day off, I promise I will chain myself to my computer and figure it out! As a side note, I heard this entire post read in my head in a Monty Python voice and that makes me happy. When I screened this movie at my 3rd grade birthday party with my new friends at my new school, I instantly branded myself “that weird kid.” Troglodyte 9-year-olds. I also used to have a bunny that looked just like the the beast in that scene, which may or may not have been intentional. Thy compliments and commentary doth fill mine heart with joyous rapture! Wouldst that I could tarry, but alas, to the road I must return. I shalt endeavor to reply in kind to each and all by morrow’s first light. First, having grown up with the King James version of the Bible, this madeth me smile a loteth. Second, having a husband and 3 stepsons who very much appreciate (and can often recite) Monty Python, additional grins. The advice is also very helpful (I just bought Premise) & well done. Thank you! Great advice. That’s why we keep our default templates very clean at Kickfofflabs. We can’t stop customers from violating all the commandments, but we at least want to get them on the right path. Thank you for putting a smile on my face this morning. I enjoyed so much reading your insightful and helpul article about landing pages. I’m taking into account all of your suggestions as I will try now with Premise (which I had bought) and also planned to recommend to my clients. Thanks a lot for the great and funny post! I’m laughing too much to know what to say. On the first commandment… one goal per page… lots of people kill that commandment with their sidebar… often the sidebar enticements are more interesting than the call to action on the page, if there even is one. A good landing page hath no sidebar. Thou shalt make no sidebar upon thy landing page, for it is an abomination. Doth thou knoweth the difficulty of explaining the no sidebar commandment to the client? 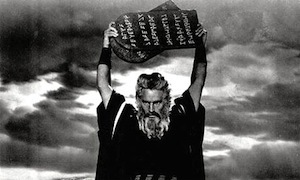 They oft thinketh that sidebar with icons and subscribe bribe is the first commandment. Oh wait. I have an idea. Thank you!! Premise has been such a great resource for me in helping me build a better landing page. Can’t recommend it enough! I actually smiled reading this, it took me a bit to “get” the subheadings, English not being my first language and I never read the 10 Commandments in English. Way too cool what you did here. I learned a lot about landing pages reading Copyblogger and using Premise plugin and this is like a cherry on top, I can always use an extra tip or two. I guess it will take more work to get to where I need to be but all you guys do here helps a lot! Thanks! “Lamentation and madness.” Very cute. Thou hast given me great guidance with these commandments as they apply to thy kingdom of blogging. Really Steven, I think you’ve stumbled upon something here — your new online persona. bloggingwithkingjames.com is available. I wish all so-called internet marketing experts would read this article. Well done – no vanity, just results ! I have just started getting into Internet Marketing and your advice really helps. Unfortunately, your choice of style (thou shalt, etc) really put me off and so I stopped reading after a few sentences of point one. Clearly your time is valuable, as demonstrated by your need to comment about the waste of your time. You lost me at Hi. Verify, thou canst not pleaseth all. A thoroughly enjoyable read. thanks. Working on landing pages, so glad I came across this. Not only was it informative, it kept my attention the entire time. Definitely don’t have a concise call to action for many of my clients. Going to have to work on that. Funny post I haven’t read for a wile. But in the same time very informative. Thanks for the share. LOL and so true!!! Thank you for an awesome post. Great post! Can you do that in iambic pentameter? You guys rock, but I have to say that this whole “take a celebrity or movie” and force some parallel lesson out of it felt pretty thin in the first place, but got to feeling old very fast. Personally, I find it gimmicky and unworthy of your awesomeness. Just sayin. We all get that Steven’s post is a riff on the 10 Commandments from the King James Bible, not the cheesy 10 Commandments movie with Charlton Heston, right? Just want to make sure, there. Thanks for that. I am not a marketing person nor am I a webmaster; I am a salesman, pure and simple. I am setting up a new business and having discussions well into the night with my webmistress about ‘what’, ‘where’ and ‘why’ as they relate to the various pages. This article helps me to focus a bit more on the way the site needs to be laid out. Mostly #’s 1, 4 and 5….. This piece was an absolute joy. Art, entertainment and education all packaged up beautifully within a couple of hundred words. Tidings of gladness; I rejoice! Speaking of landing pages, they should be clear and easy to read. This post failed that test, I would have just written the list item titles in the biblical way and the meat of each list item regularly, I love to read (especially this blog) and enjoyed scanning this post, but I couldn’t read this past #4. “Thou shalt not try to be too cutesy” and ruin a good post topic should be the 11th commandment. Methinks he mistook thy post for a landing page. Stop making people think. G-d and Moses was impeccable. Today, I was making a major effort to better understand the landing page and then your Work magically appeared in my Gmail. How coincidental. LOL! I am going to go check and see how many commandments I have broken, I do feel a little sinful. I feel the truth in your words though! Thank you again, Y’all rock! Best tip is #1 and really is the precursor to all other 9 commandments. Every element of the landing page has one goal. Fun article. Thou hast most definitely compiled a list most worthy of complying with in the utmost. That thou may converteth as many visitors that do visit such a page, and maketh a profit from such visitors as do visit a page such written is most certainly the goal worth striving for in these days of such distraction and hyperbole that dost plague so many a web page or landing page. With many thanks for such a message, I bid thee farewell and wish thee glad tidings in this new world of Internet Marketing which hath replaced the age of the wooden sign above the commercial establishment. By James I think he’s got it! Some may call this sacrilegious… I call it sacrilicious; It’s blasphemy that helps you sell! Fully enjoyed the twist on this. If I’m going to hell, it’s not going to be for writing bad copy! A Golden Rule might be: “Don’t do unto others as you would like them to do unto you..Instead, speak unto your prospects and customers only after understanding their personality types. Speak to them they way they want to hear, the way they want to learm, and the way they would like to buy. People buy people like themselves (same personality type) whether it’s a multi million dollar deal or choosing a grocery store. Get into their personalities and speak their language.Do that and they will become your customers when the monent is right. This is one heck of a hilarious post! I couldn’t stop laughing till the very end of the post. I like the use of thy and thou and hath. Surpass not thy Master, lest vanity consume thee, and a horrible sickness come upon thee, first transforming thy face into that of a devil, second infecting thy loins with a terrible itching, and third bringing the wrath of the IRS down upon thee, consuming all thine worldly possessions in a righteous fury. Or, in other words, your post now has more tweets than mine. Dammit! No, seriously dude, I’m SO happy for you. Really awesome job. Blessed are ye who heedeth well the words of thy teacher, and doth endeavour to practise such wisdom with humility. Grateful shall ye be in the full light of his praise. Credit shall ye give, yea, and sing his praises unto the blogosphere, so that others might know and rejoice in his offerings. Go ye, now, at once, to http://guestblogging.com, if thou dost desire to bask in such light. And know ye this humble truth: this post was vastly improved by the title tweaking and engaging introduction written by Sonia Simone. I stand on the shoulders of giants – and call them friends. These are so great. Truly words to live by (yes…hence commandments). Working in the email marketing and social media world, all of the work I do on that end is for naught, if the landing pages I send people to aren’t up to snuff. You can design great email campaigns, craft the perfect subject line or call to action and write excellent copy, and a conversion can be lost if the landing pages don’t do all the same things. I really would love to hire someone to design my websites. I know a little about HTML, but I’m not thrilled with some of the ‘free’ WordPress templates or even the ones that web designers want you to pay for. I pay attention to color schemes, font size, and line spacing. I have a graphic design background. I tweak my websites as best as I could, but I know they could be better. I like ‘clean lines’ and designs. And thou shalt not use more than one column wherever possible. Commandment No. 1: applies to everywhere. Whether it’s physical brochures, flyers, advertisement etc. Only 1 goal. Too many goals confuse the prospect. While I think that compiling a list like this is important – I’m not sure that having a be all tell all list works when it comes to landing pages. I think that all of these numbers will likely be tweaked based on your specific company’s needs. The way it was written was very entertaining and I do plan on taking this with me to share. Thanks! This was quite the unique way to outline some concepts. I like it. It actually made for a interesting read even with the old English.